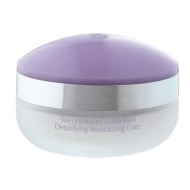 DESCRIPTION: Hydro Harmony DD Cream Yeux from Stendhal is an eye contour cream that has been specifically formulated to minimize the signs of aging and fatigue. Thanks to its fluid texture, active ingredients and last generation correction pigments, which moisturize, makes the contour of the eyes smoother and reduces dark circles for a very natural result. Apply in the morning in the eye contour area.